Pacific Sportsfishing offers world-class sportsfishing destination located in beautiful Port Renfrew on Vancouver Island's West Coast. If you've come to wrestle our famous Halibut on the prolific Swiftsure Bank or fight some of our famous Pacific Salmon ... you've come to the right place! 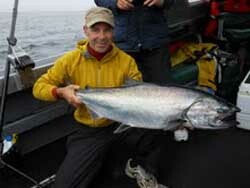 Join Dan Harvey and Pacific Sports Fishing for a West Coast Salmon & Halibut Fishing Charter. Dan offers professional & personal guide service for groups, corporate, and families. His custom-welded 24 foot Eagle Craft vessel, "Knuckle Buster", is Transport Canada Certified, with all the equipment needed for your comfort and safety. Charters include 4-8 hours of action-packed fishing, including all tackle, bait, gear and processing of your catch is included. 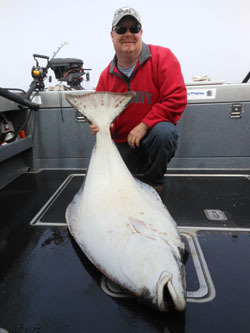 Full day fishing trips head off-shore to the famous Swiftsure Bank for world-class halibut & salmon fishing. 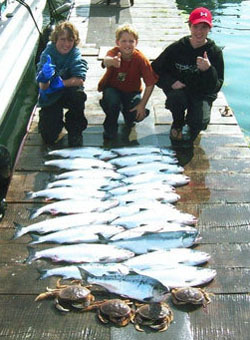 Fishing season is June to October, with fantastic Fall Coho Salmon Specials in Sept-Oct. Bonus... All charters include complimentary crabbing (in season). Prime times are limited, so don't delay, reserve early to secure preferred dates. Prices do not include applicable taxes (GST/HST), licences, or gratuities. Fuel surcharges may apply. Here's what a happy fisherman, Bill Mooney, has to say about Dan Harvey and Pacific Sportsfishing: "I have fished the West Coast of Canada for over 40 years and have experienced a full range of fishing experiences, from guiding my own boat to living in the most exclusive lodger available. I started fishing with Dan Harvey several years ago and have had Dan organize all my trips since then - most of these where I have brought out large groups of corporate clients from Canada and the United States. These trips have been exceptional not only from being highly organized safe and professional, they have been tremendous "West Coast Experiences" for all involved. Dan not only gets you fish - everyone goes home thinking he or she is a fisherman! I never think about where I'm going anymore - I just think about when I can get there!" Accommodations can also be arranged -- contact Dan at 250-954-3997 or visit the Pacific Sport Fishing Charters website for more information. Make you sure you check out Dan's photo gallery to see photos of the fun from past charters. 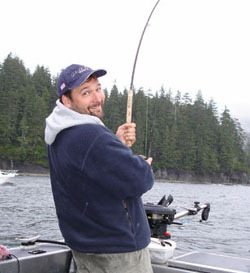 More about your host, Dan Harvey: I am the, owner/operator of Pacific Sportsfishing. I have lived on the BC Coast my entire life, which includes over 17 years working with the Canadian Coast Guard on a Search & Rescue Vessel. I have extensive knowledge of the West Coast and hold a Professional Transport Canada Certification as a guide and vessel operator. I have fished/guided professionally for over 25 yrs and work hard to provide you a productive, safe and relaxing experience. I look forward to hosting your next fishing adventure. You don't have to travel far to fish one of the most incredible places of earth. Give us a call. I would be happy to share some local Port Renfrew hospitality.